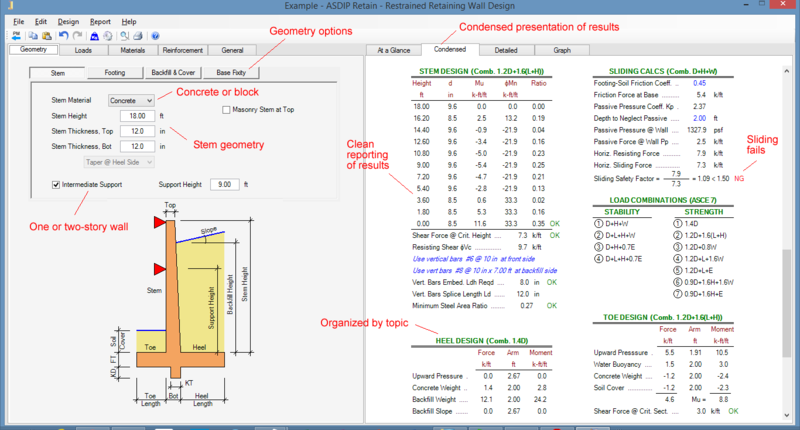 ASDIP Structural Software announces the release of the new version of ASDIP RETAIN (Version 4) engineering software. 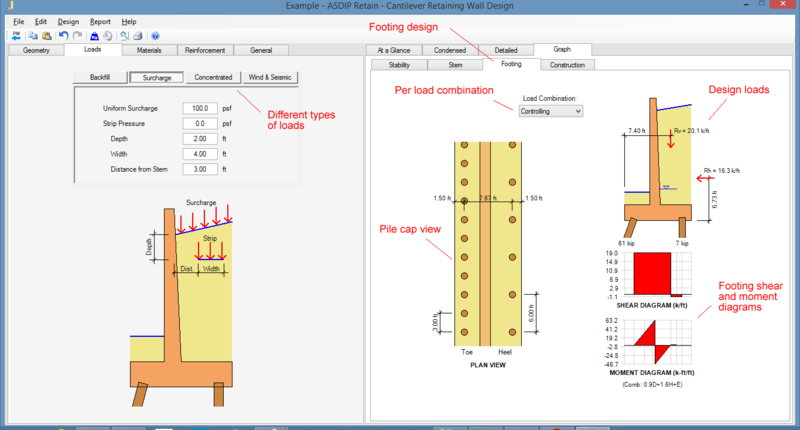 Design professionals utilize ASDIP RETAIN software for the design of retaining walls. Following are some of the most important features included in this version 4. What modules are included in ASDIP RETAIN 4? Cantilever retaining wall – Stem can be concrete, masonry, or a combination of both. Either supported on soil or supported on piles. Counterfort retaining wall – Concrete stem supported horizontally by a series of counterforts, either supported on soil, or supported on piles. Restrained retaining wall – Either one or two-story basement walls. Stem can be concrete, masonry, or a combination of both. Either supported on soil or supported on piles. All walls can be either supported on soil, or supported on piles. Up to three rows of piles may be modeled, either vertical or batter. 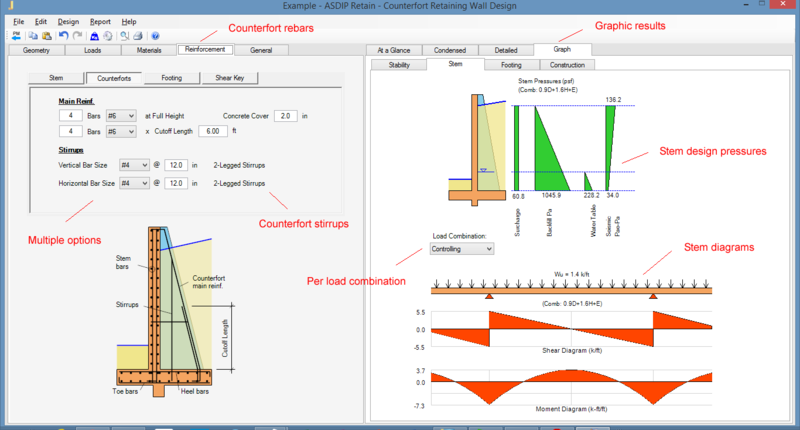 A brand new module added for the design of Counterfort retaining walls. Multiple options to model geometry, loads, and reinforcement. 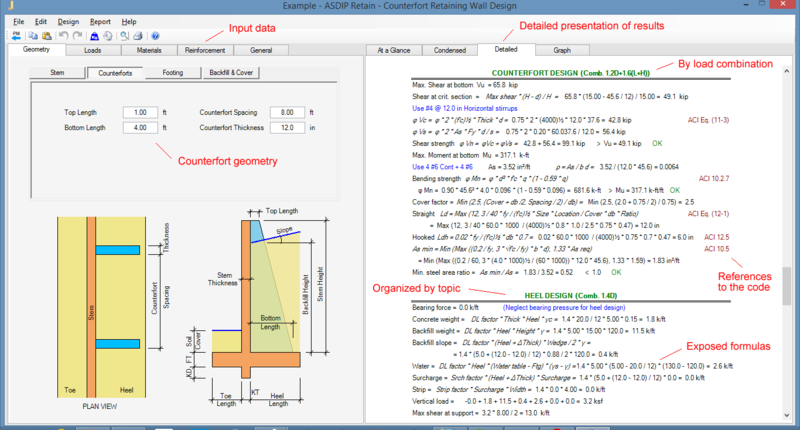 The Restrained wall design module now includes either one or two-story basement walls. Software designs the single span or continuous stem accordingly. Software finds and reports the controlling load combination in the design of each component, per limit state. For example the load combination in the bending design of the heel, etc. The annotated screenshots below provide a quick insight of the software. Walls either supported on soil or supported on piles. Simple and efficient graphical user interface. Three levels of results: At-a-Glance, Condensed, and Detailed. Condensed tab shows the most relevant results, by topic. Diagrams, forces, and checks per load combination. Multiple types of loads applied to the wall. Graphical results per each component. Up to three rows of piles, either vertical or batter. Graphic pressures and forces per load combination. Multiple options to model the reinforcement. Model stem, counterforts, piles, and footing in separate tabs. Graphical view of the stability pressures and forces on the wall. Detailed tab shows step-by-step results with exposed formulas. and references to the code. Specify rebars for each component easily and obtain immediate results. Design the footing quickly, either supported on soil, or supported on piles. Graphical view of the stem shear and moment diagrams, as a continuous vertical slab. Print Preview of reports just with a click of the mouse. Model either one-story or two-story basement walls easily. Deign Criteria shows multiple options to customize the design. Stem can be either concrete, masonry, or a combination of both. Clean and organized reporting of results, showing the controlling load combination. Support at base may be either pinned or fixed. Graphical view of the stem shear and moment diagrams. Model surcharge, wind pressure, concentrated forces, and seismic loads. 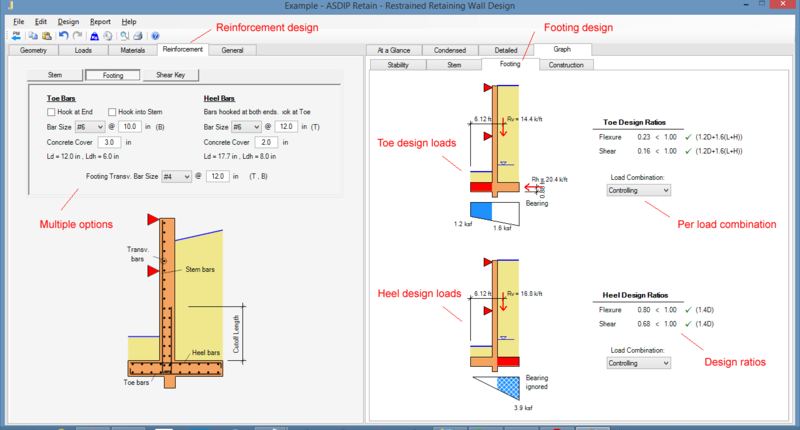 Graphical view of toe and heel load pressures and design ratios. 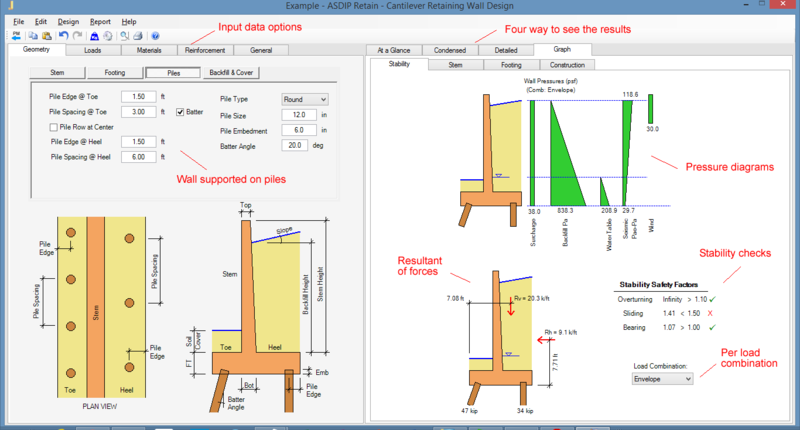 Detailed information is available about this structural engineering software by visiting ASDIP RETAIN. For engineering background, please see my blog post Cantilever Retaining Walls: An Overview of the Design Process (Part 1) and (Part 2).